With the Pedernales River flowing behind this 1900s farmhouse, you will find a home filled with family memorabilia and lots of family antiques. This quiet home has a lot to offer. Come relax in the living room and listen to the soft relaxing music that awaits you when you enter. You can watch satellite TV or perhaps a movie, or maybe read all about the history of the home and the family. You may want to also enjoy what Mother Nature has given us on the screened back porch. The large farmhouse kitchen has everything one might need when away from home. Coffee, teas, popcorn, snacks, dry cereal are just a few amenities provided. In addition, a variety of breakfast items are provided including eggs, homemade sausage, homemade pancake mix, oatmeal, bagels with cream cheese, and homemade angel biscuits. Walk into the romantic, warm colors of the master bedroom. Designed with romance in mind, a luxurious king bed and many antiques await you. The second bedroom has a queen bed and has been designed with military memorabilia from the host's great aunt's son. The room is filled with things from his war days. In the bathroom, you may want to relax in the bubble tub that massage your worries away. The warm romantic colors and décor will make you fall in love with this relaxing home. It has a hairdryer, curling iron, bubble bath and much more are provided for you and your stay. 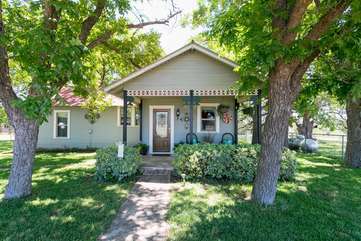 The house has a nice fenced yard with pecan trees and a special area with a hot tub for you to relax in. At night you can sit back in the swirling water watching the stars or falling in love with your partner all over again. There are trails for you to take a walk to the river. You might want to bring your fishing gear and a picnic lunch. You can enjoy grilling under the huge live oak tree that is about 200 years old. The tree is about fifteen and a half feet around at the smallest part of the trunk. The host's great-grandparents used to churn butter and wash clothes under this tree. Great-grandmother's wash pot and chair is still under the tree for you to view. You may want to sit on the swing under the tree and enjoy nature. Country Quiet is just one mile from Lady Bird Park, the golf course, the fairgrounds and the airport. The land, the home, and the memorabilia are the host's tie to the past. They would like you to enjoy it during your stay. There is a Ring video door bell on the front porch. AMENITIES - Central heat/air, 32” TV (satellite), VCR/DVD, CD Player, WIRELESS INTERNET, Ceiling fans, front porch, hot tub, enclosed back porch with sitting area, fenced yard, hiking trails, Pedernales River access, fishing (bring your own equipment), barbecue pit, picnic area, swing under very old oak tree. (If you have an anniversary, birthday or something special, let your hosts know). Fabulous country home only a few miles from Main Street. Wonderful property and delicious breakfast! Peaceful and beautiful and only a few miles from town. From the beautiful sunsets, the hot tub , the short drive to Luckenbach to see Gary P. Nunn and visiting all the stores in downtown , me and my girlfriend just loved the place. Lastly we will never forget our picnic down by the river. Such beauty everywhere. Thank you for sharing your place with us, we will definitely be back! Just 5 Stars? How \'bout 6+? Lots of new stuff since our last visit ... all for the better. Some paint, some furniture, some windows, some arrangements. You MUST stay here or you will miss out on the best place around. The attention to details by the hosts is unfathomable. Daily breakfasts are beyond delicious. We\'ve already reserved Country Quiet for our next visit & are making plans for another trip after that. It has become our second home! We enjoyed our stay at the guest house, beautiful property and very cozy! The host made sure everything was perfect and the breakfast was great everyday! We will stay there again!! This Quiet guesthouse is the best bnb I’ve stayed at in Fredericksburg! We enjoyed the beautiful property with plenty of wildlife and access to the Pedernales River. The home is only five minutes from town while remaining very secluded. We were happy to discover it is in driving services range, which we used to go to the 290 wineries close by. Thank you for a fantastic stay! We enjoyed our stay at the Country Quiet Guesthouse so much! The house itself is so cute, with a nice fenced yard that offers both privacy while relaxing in the hot tub and a great view of the scenery outside while sitting on the back porch. The house is beautiful, inside and out. We enjoyed exploring all of the family history inside, as well as exploring nature outside. As soon as we unpacked, we went to check out the river trails - we took the short one first, which has a nice view at the end, but if you want to get down to the water, take the longer trail. On our way, we saw multiple deer, birds, and a baby armadillo. The kitchen is fully stocked with everything you need to cook (pots, pans, dishes and basic spices), if you want to do that, and the breakfast and fresh eggs that were provided were delicious. In the evening, we enjoyed playing board games on the porch and relaxing in the hot tub. The house is just a quick drive into town, but far enough out to have a peaceful vacation. We all enjoyed our stay (Even my 15-year-old said "Mom, this is way cooler than I thought it would be. Let's come back!") and are already planning our next visit(s). The breakfast was delicious! The house is as described with a lot of memorabilia. It is so peaceful at night. We sat outside for a while and it was nice to be away from all of the noise. If you like staying in older, historic homes this place is for you! The guest house was cute and the property was beautiful and relaxing! The host provided delicious breakfasts, but also gave us our privacy. We truly enjoyed our experience here. We loved this place! It was just exactly what we wanted and needed for our family. It is rustic in the best of ways, yet has enough modern touches to be comfortable. The house has a fenced yard all the way around it so you can let the kids and/or the dogs run around knowing the can’t wander off too far. You also have access to the river by walking down one of the trails. Sharon was so nice and made a delicious breakfast for us to bake and eat each day. Can’t wait to go back again soon. This was a great property! We enjoyed the trails to the river and the quiet, country atmosphere. Would definitely stay here again! Being just south of the city, our trips into town were quick and convenient. The traffic on the highway could be seen, but not heard from the home. [Watch for cattle ambling along the driveway!] The house has lots of room to spread out. A short hike from the back door is a beautiful, crystal clear stream with a babbling flow. An inviting hot tub is just off the front porch with stepping stones to lead the way. The warm water felt heavenly, especially since the chill factor was in the teens. The screened back porch was my wife's favorite hiding place, although the weather was too cold at night to try the bed. The bed in the master bedroom was very soft, yet provided terrific support for my bad back. A spacious kitchen invites you to try out your cooking talents with a full sized range. Oh, and the breakfasts prepared by the hosts are definitely 'to die for.' Antique buffs will enjoy the decorative points of this home. Lots of history here, but not overwhelming. Try it; you'll like it. We've already made reservations for an encore visit this summer to celebrate our 49th anniversary in June.